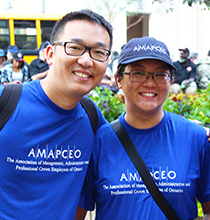 While red may still be the dominant colour this February 14, add a splash of pink and celebrate Pink Triangle Day with AMAPCEO. The origin of the pink triangle is one of hatred and oppression: in concentration camps during World War II, Nazis forced gay male prisoners to wear an inverted triangle badge on their jackets. Over the years, the triangle has been reclaimed as an emblem of queer pride, resistance and solidarity. Some lesbians later adopted the black triangle as a symbol of defiance against repression and discrimination. Here in Canada, the pink triangle is also used to symbolize a major advance in the gay rights moment: In the late 1970s, three gay activists were charged with indecency for an article that appeared in the Toronto-based magazine The Body Politic. A precursor to DailyXtra—which is still published online today—The Body Politic was a monthly journal that became a major catalyst for gay liberation in Canada and an influential voice worldwide. On February 14, 1979, The Body Politic’s publishers were acquitted of all charges in a court ruling widely considered to be the first major legal victory for the Canadian queer movement. Pink Triangle Day was proclaimed later that year by the Canadian Lesbian and Gay Rights Coalition to celebrate the victory. The date of the court ruling—Valentine’s Day—was fortuitous and presented the Coalition with an opportunity for further resistance against societal oppression and heteronormativity. Learn more about Pink Triangle Day in DailyXtra, or watch a 2015 video interview with Pink Triangle Day creator Robin Metcalfe on CTV Morning Live.